Elvis Presley's Graceland, the Sistine Chapel, the Atlantis Space Shuttle, a Medieval Castle and an Ancient World Globe are all 3D puzzles that are in Puzz 3D's portfolio. 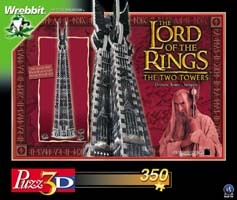 But what better way to bring the range to a younger generation than with the help of The Lord of the Rings' themed puzzles. 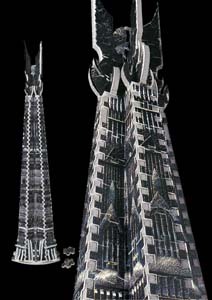 The Orthanc Tower is beautifully recreated in 350 jigsaw pieces which towers (no pun intended) above other puzzles, at just under 70cm in height. There are simple enough guidelines on how to complete this puzzle, but you'd be foolish to think that it is simple to complete. Far from it. But, be thankful, there are Puzz 3D products out there that have the picture printed on two sides - making it near impossible to complete unless you are a puzzle master. The detail on the Tower is impressive, as is how rigid it is (no sniggering at the back) once it is erected (Oi! I warned you!) And this is an excellent introduction into the world of the 3D puzzle. Don't be surprised if Grandparent's start to moan: "3D? In my day jigsaw's were flat! None of this new fangled 3D malarkey!" This is not what they are used to! And strange, alien things only scare them... I'd leave them to their jigsaws of woodland glades and New York street scenes if I were you. An enjoyable and challenging puzzle that may look a little odd but is still good fun. Not quite as attractive as the other The Lord of the Rings puzzles, but still worth taking a look at.